These raptors may be found on nearly every corner of the world, but the Chesapeake region is home to the largest concentration of nesting osprey. The Chesapeake Bay supports the largest breeding population of osprey in the world. While the widespread use of toxic pesticides pushed populations of the fish-eating raptor to an estimated low of 1,450 breeding pairs in the early 1970s, a 1972 ban on the pesticide DDT helped populations recover. By the mid-1990s, an estimated 3,500 breeding pairs were found on the Bay, and breeding was documented on almost half of the Bay's tidal tributaries. Research conducted around this time also showed an increase in reproduction among breeding pairs, with rates growing from less than 0.8 young produced per active pair in the 1960s to more than 1.2 young produced per active pair in the mid-1980s. Reproduction rates returned to less than one young produced per pair in the late 1980s. Estimates from the Center for Conservation Biology place the Bay's current osprey population at eight to 10,000 breeding pairs, with the world population estimated at fewer than 100,000 birds. 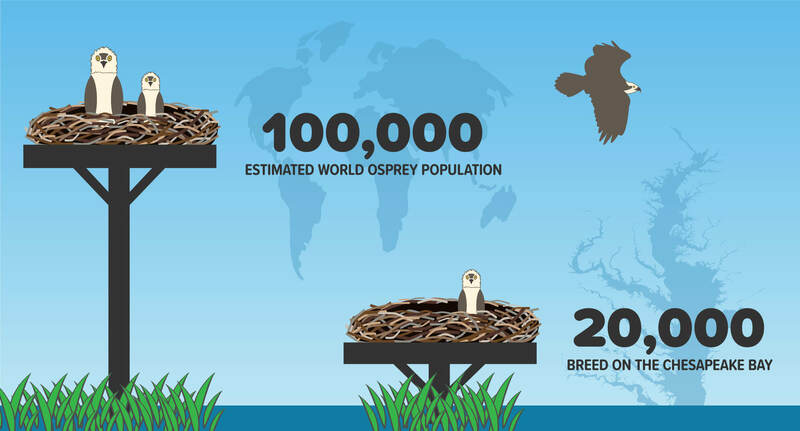 While a rise in the availability of man-made nesting structures has made a huge contribution to osprey recovery, the release of toxic contaminants into the water and up the food chain continues to threaten osprey health and reproduction. To protect osprey, consider using non-toxic pesticides or chemical-free cleaning products to curb the amount of toxic contaminants entering the water. You can also follow safe and legal disposal methods for paint, motor oil and other household chemicals, and keep pharmaceuticals out of waterways by returning unused medicine to a consumer drug return location.